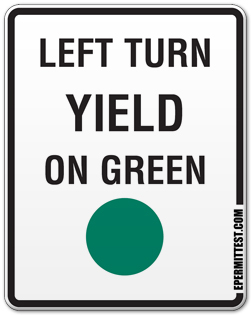 The "LEFT TURN YIELD ON GREEN" road sign is installed at busy instersections to remind drivers that they can make a left turn on green signal, provided they yield to oncoming traffic. Some drivers make the mistake of waiting for a green arrow signal to appear to be able to make a turn. While turning on a green arrow signal does give you the right-of-way over oncoming traffic, since you are making a protected turn, you can still make a left turn on the regular green signal.